The Forced Air Electric heaters used on the Walton Hot Air De-icing Systems are built specifically for Antenna De-icing Systems. The Heating units are built to Walton’s demanding specifications in order to provide reliable operation over a long period time and under difficult climatic conditions. The heater (including the heater element’s fins) is made of Stainless Steel, and all hardware is either stainless steel or aluminum, for a rust and corrosion free life. These heaters also incorporate the latest innovation with V-seal technology. Because these heaters are inactive for long periods of time, while also being exposed to the elements, preventing moisture absorption is paramount for long trouble free heater service. V-Seal Technology does just that, and extends the life of the heater elements and improves their reliability. 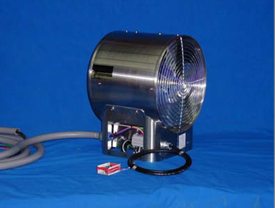 The fan motors are totally enclosed fan cooled (T.E.F.C.) motors, which are better suited for this type of outdoor operation than open winding type motors. These heaters also incorporate built in thermal devices, which provide high heat protection.